DUET Group's securities reached a three year high of $2 on 13 June. DUET has confirmed that the final distribution for the six months to 30 June is 8 cents per stapled security. The full distribution will be 16 cents per security. The distribution guidance for 2012-13 is 16.5 cents per stapled security. Chief executive officer David Bartholomew said "Our FY13 distribution guidance meets the medium term 3 per cent per annum growth target provided at the time of DUET's entitlement offer last year." DUET's performance fee calculation period commenced on 1 June and ends on 29 June. The performance fee is based on 20 per cent of any amount that the DUET accumulation index outperforms the S&P/ASX 200 Industrials Accumulation Index in the six month periods to 31 December and 30 June after having made up for any deficit carried forward. The performance deficit from the prior period is $65.3 million. The average performance surplus calculated over the nine trading days to 14 June was $101.4 million. Should a performance fee become payable it would be 20 per cent of the average performance surplus calculated over the last 20 trading days of June 2012. Mr Bartholomew said "DUET's stapled security price has significantly outperformed its benchmark during the 2012 financial year following completion of a number of strategic initiatives in 2011 that strengthened and simplified the Group. "DUET's security price is currently trading around 29 per cent above last year's entitlement offer price of $1.52." GWA Group is to acquire ASX listed security and locksmith group Q Technology Group Ltd. The cash consideration is 3.8 cents per share. This gives it an enterprise value of $20.6 million, which comprises an equity value of $7.4 million and assumed debt obligations of $13.2 million. The QTG Board unanimously recommends the deal. The acquisition complements GWA's security products business, which is environmentally neutral. QTG has revenue of $50 million and 200 employees. It has two operating businesses, Q Video Systems and API Locksmiths. Q Video Systems is an importer and wholesale distributor of security surveillance, monitoring equipment and alarms. API Locksmiths is a supplier of locksmithing services, safes, locks, and alarms. It has a national network of offices, and contracts with major enterprises including banks, casino and building management companies. GWA managing director Peter Crowley said "The proposed acquisition of QTG, including the businesses operated by its subsidiaries, Q Video Systems and API Locksmiths, provides access to new markets and logical product extensions to our Door & Access Systems Division. "QTG has a successful management team, high quality products and a strong position across the markets in which it operates. The operating businesses have not been able to achieve their potential in recent years under the burden of excessive debt and we expect the inclusion of QTG in the GWA Door & Access Systems Division will provide the business a strong platform for growth. These businesses will further strengthen GWA's market offer in residential and commercial access systems and provide a service capability to complement our product offerings." QTG will boost annual sales of GWA's Door & Access Systems business to $200 million. Aspen Parks Property Fund is increasing its annual distribution to 10.9 cents per security from 1 July. The Fund said this due to another year of strong operational performance and a positive outlook for 2012-13. At 10.9 cents the annual income yield is 8.7 per cent based on the underlying security price at 1 June of $1.2466. "It is important to also note that despite the increase to income distributions, the Fund will be maintaining a payout ratio of circa 80 per cent of forecast operating cashflow," it said. "Not only is this further evidence of the underlying strength of the Fund, it provides valuable retained earnings for future capital expenditure or debt reduction." The Fund compared its increased distribution rate to the recent reduction in deposits rates to suggest that it is an "excellent time to consider or continue an investment in the Fund". The Fund has been paying monthly distributions since inception in 2004. Transpacific Industries has ceased to be a substantial shareholder in DoloMatrix International, which earlier this year sold its waste management businesses to Tox Free Solutions. (ASX: TPI). Infigen Energy's Woakwine Wind Farm in south east South Australia has received development consent. The proposed wind farm will comprise 124 wind turbines, a substation, tracks, cabling and other wind farm infrastructure. The project will continue along the same ridgeline as the Lake Bonney Wind Farm. There are about 45 landowners involved and who could benefit from sustainable and drought-proof income when the project proceeds. Infigen Energy also said it is committed to involving the broader community in direct and indirect project opportunities. "The new substation will increase access to more electricity from the network to farmers who currently rely on costly diesel generators. This is good news for regional wineries and dairies, who can modernize their farming equipment," said one of the farmers, Robin Ling. The project's construction is expected to create 150 jobs and its operation another 18 ongoing jobs. Infigen said that over the last four years it has undertaken a comprehensive environmental assessment to help define the final layout and a significant number of alterations were made to account for environmental constraints and concerns highlighted through the community consultation process. These included the removal of wind turbines in the vicinity of Cape Jaffa, the Mt Hope ridgeline, the Rendelsham community and individual properties. "Using the onsite wind monitoring equipment and our experience at Lake Bonney, we were able to design a layout that is strategically positioned to harness the stronger wind resource, while still maintaining sensitivity to the environmental constraints of the site," said Frank Boland, development manager at Infigen Energy. Infigen may also benefit from the new go ahead for the large scale solar power plant in NSW announced by the Federal Government under its Solar Flagships Program. CBD Energy has started building solar projects in Italy, using the US$25 million construction finance facility it negotiated last month. The first project, 5 MW and worth around 13 million, is expected to be finished in July. Discussions are underway with institutions about buying the project on completion, with CBD managing and operating it for the new owners. CBD expects its financing facility to support ongoing project volume of 5 MW a month. The projects are designed and managed by CBD subsidiary, CBD Solar International. The company will sell these initial projects when they are completed, but over time it intends to retain some projects as they typically have internal rates of return of over 15 per cent and have 20 year power sale agreements. Transpacific Industries has ceased to be a substantial shareholder in DoloMatrix International, which earlier this year sold its waste management businesses to Tox Free Solutions. (ASX: DMX). Shares in ERM Power spiked to a new all time high of $2.20 on 13 June. On the same day its partner Empire Oil & Gas NL announced it had been granted a Petroleum Exploration Permit in the Southern Perth Basin of WA, in which ERM Gas Pty Ltd is a joint applicant. The permit, EP 480, is near Pinjarra and consists of 22 blocks totaling 1,760 square kilometres. The permit is for an initial period of six years. The interest is natural gas. Shares in Solco fell to a three year low of 3.1 cents on 14 June. Two days earlier the company revised down its revenue guidance for 2011-12 from $27 million to $23 million. It also said it has implemented further restructuring strategies and made changes to its management team. The new management team and operating structure have been introduced by the new chief executive officer, Anthony Coles, as part of a strategy to return to profitability through a more customer-focused approach. over supply and changes in the regulatory environment in Australia," he said. All layers of the supply chain, including cell producers, panel manufacturers, wholesalers and retailers/ installers have been affected by these changes to the environment. Despite a drop in revenue, Solco is positive it can prosper in this new environment as it continues to grow its earnings, he said. The third quarter had below forecast results, but in May the wholesale business achieved its best month for 2011-12. The company has further reduced operating costs by restructuring warehousing and logistics. "Our procurement, logistics and pricing have now been addressed to meet market needs and as a result sales have been climbing in Q4," said Mr Coles. Delays on some of the large commercial solar projects scheduled for completion in the fourth quarter also contributed to the revenue adjustment. "We had to make a number of tough decisions which included some redundancies but we have dealt with our aged inventory and re-established our core vendor relationships; as a result we are well placed for the post-rebate solar PV environment we are now experiencing." New management appointments include Bob Matthews joining the company as chief operating officer and heading the commercial projects business. August Investments paid an interim dividend of $5.00 per share on 1 June. The dividend is the same as the June 2011 dividend. Shares in Orbital Corporation fell to a one year low of 21 cents on 15 June. In mid May they were 30 cents, making the fall 30 per cent. In a market Update in May the company said it expects to make a loss of about $3 million for the current second half and for the full year ending June 2012, which will reflect a loss in the Consulting Services business and a lower contribution from 42 per cent owned Synerject. It also said it expects to return to profit in 2012-13. Chief financial officer Keith Halliwell said "The turnaround will depend on a number of expected drivers. Firstly, we expect Synerject's contribution will revert to the growth profile we've seen in recent years. The current second half has been an anomaly compared with Synerject's recent reported results. "Secondly, Consulting Services revenue is targeted to return to levels that will at least cover the cost base of our engineering resources and facilities in Perth. "Lastly and most importantly, we've recently secured a $4.7 million order to supply heavy fuel engines for use in small unmanned aircraft systems (SUAS). This is a new business for us; the engines will be supplied out of our Perth facility and will contribute to a turnaround to targeted positive results next year." The contract with AAI Unmanned Aircraft Systems will see Orbital supply engines for the Aerosonde SUAS throughout 2012. "The AAI order is $4.7 million, which is significant compared with the historical level of our order book and also compared with the typical orders in our Consulting Services business. It's anticipated that the engine will be supplied over the next months," said Mr Halliwell. Chief executive, Terry Stinson, said "We expect this contract will lead to future business in the SUAS field. The targets for growth include full engine systems, similar to what we're producing for AAI, new engineering contracts (for R&D, fuel systems and engines), fuel system and engine management systems (EMS) supply, and potentially licensing and royalty opportunities. Po Valley Energy has executed a farmin agreement with Petrorep Italiana S.p.a. (PETROREP) for the Cadelbosco di Sopra exploration licence and an option agreement for the La Prospera exploration licence  both in the Po Valley in northern Italy. The agreement allows PETROREP to earn a 15 per cent interest in the up-coming work program for the Cadelbosco di Sopra permit, which includes drilling three exploration wells for which the drilling approval process is in progress. PETROREP can also earn a 15 per cent interest in the La Prospera licence, which includes one exploration well which is in the final stage of the drilling approval process. PETROREP's participaton is subject to certain conditions. PETROREP will commit to a share of future drilling expenditures and reimbursement on past costs. Po Valley Energy will retain the residual interest and retain operatorship. The farmout agreement for both licences is subject to regulatory approvals by the Italian Ministry of Economic Development. Po Valley chief executive, Giovanni Catalano, said "The commencement of a joint venture partnership represents an important initiative for PVE. We welcome the partnership with PETROREP, which has a long and successful track record in Italy. Active in Italy since 1968, PETROREP's strategy is to participate in ventures through a minority interest and it has consistently proven to be an asset to its partners from both a financial and technical standpoint." "The farmin into these two licences by an experienced partner is an important first step in our stated development strategy which aims to accelerate the short term work program by drilling low risk assets with farmin partners; allowing us to accelerate the movement of Contingent Resources into the Proven category." The terms of the farmin agreement are commercial-in-confidence, but are favourable by Italian standards and confirm the commercial attractiveness of the company's development portfolio, he said. The company is progressing discussions with other potential farmin partners about its other 100 per cent owned exploration assets. Vmoto's shares fell to an all time low of 0.9 cents on 14 June but quickly rebounded to 1.1 cents. In a market update the company said it continues to increase its global distribution network into new countries including Brazil and Lebanon. Its production lines are busy as fulfilling orders from existing customers. New opportunities are arising in existing markets including Italy, Germany and Malaysia, and it is in discussions with distributors in new target countries including India and Indonesia. In Europe, its Slovenian distributor, Plan-Net d.o.o, has ordered 17 units of the E-Max electric scooter for the dealer network they established earlier this year. Vmoto has supplied 13 test units to Itella (Finland Post) with another 150 electric scooters expected to be ordered within the next 12 months. Vmoto's Italian distributor, Nemax SRL, has ordered four containers of E-Max electric scooters with between 36 and 42 units in each container. Sailpost, the largest privately owned delivery company in Italy, has placed additional orders for Vmoto's electric scooter powered by lithium battery. Vmoto's Croatian distributor has ordered 23 units of 110s and 120L models. Brazil Post has ordered four units of Vmoto's delivery version electric scooters for further testing and assessment. A pilot project will take place in Belo Horizonte for 60 days before further orders are decided upon. Vmoto said Brazil Post has a fleet of 17,000 units of two wheel petrol vehicles, with plans to convert at least 30 per cent of its petrol fleet to electric fleet. Genuine Scooters, the third largest scooter distributor in USA, is launching Vmoto's electric scooters to the US government, B2B, logistics and delivery markets at the Government Fleet Expo & Conference in Denver this month. Vmoto has become the exclusive supplier of electric scooters for Spaceport Malaysia, a futuristic multi-billion space flights, retail and residential development project. The project will have two geographical areas: Malacca Space Centre and the Spaceflight Terminal, a green energy zone where only electric and hybrid vehicles will be allowed to be operate. A scoping study of Lynas Corporation's Duncan Deposit, which is part of its Mount Weld resource with a bias to high value heavy rare earths, estimates it is a four year development project. The Duncan Deposit is shallow and could be exploited using open cut mining methods. The next steps include a more detailed evaluation of potential locations for processing, and work that will allow a detailed feasibility study to be prepared. Lynas said it considered various processing methods as part of the scoping study. "Rare Earth ores from different deposits may require different forms of processing. The detailed feasibility study will focus on direct chemical beneficiation with demonstration at pilot scale." "Preliminary bench top test-work conducted for the scoping study achieved a recovery of approximately 84 per cent for non-cerium rare earths to mixed rare earth chloride by direct chemical treatment of the ore. The capital cost estimate for the proposed Duncan processing plant is approximately $600 million. The cash cost of production is approximately $40 per kilogram of rare earth oxide. This is significantly higher than for the main Mt Weld deposit because the proposed Duncan process involves direct chemical beneficiation. Initial pilot-to-gas sales from its Liulin project in China are expected to commence during the first half of 2013, said Dart Energy. In parallel with initial pilot gas commercialization, a full field Overall Development Plan is being prepared for submission before the end of 2012. The submission will include all of the technical work, engineering designs and environmental studies required to allow for full scale development of the field, which should facilitate a substantial increase in gas sales. Earth Heat Resources made a consolidated loss after tax for the half-year ended March, 2012 of $607,176 compared to a loss for the previous corresponding period of $753,273. Enerji has received commitments for $1,138,350 in a placement of 87,565,384 shares at 1.3 cents each. Every two shares come with one attaching option. Geodynamics and Origin Energy have sold their drilling rig, Rig 200, to Pangaea Resources Pty Ltd for $21 million in cash. The sale should complete on 30 September. Before then Pangaea can elect to withdraw from the sale. Pangaea has agreed to pay a deposit of $1 million that will be forfeited if it withdraws. Greenearth Energy and Israeli technology partner Metrolight Ltd believe their energy efficient smart lighting technology is poised to assist industry and communities deliver substantial energy savings against a backdrop of energy cost increases. In February the Minister for Climate Change and Energy Efficiency, Industry and Innovation, Greg Combet, launched a $1 billion funding program for manufacturers to improve energy efficiency and reduce pollution. Minister Combet has now confirmed that monies will be available for smart energy projects including upgrading street lighting. The two companies beleive they can benefit, as Metrolight has a track record of delivering street lighting solutions that give savings of over 60 per cent while reducing maintenance costs and CO2 emissions. Managing director of Greenearth Energy, Mark Miller, said the Clean Technology Investment Program coupled with Metrolight's energy efficiency technology could drive substantial energy savings, reductions in maintenance costs and better environmental outcomes. K2 Energy has extended the closing date for its share purchase plan from 15 June to 12 July. "Without such an extension, the Board is concerned that all shareholders may not have sufficient time to assess their position and lodge applications given the proximity of the existing closing date," said the company. Kimberley Rare Earths has promoted non-executive director, Jon Parker, to deputy chairman. The appointment is in recognition of Jon's increasing involvement with the company's current focus on corporate and asset value add initiatives, and his extensive experience in the M&A space, said the company. 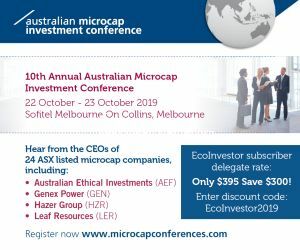 "Jon has more than 30 years of broad strategic and management experience in the resource and energy sectors with roles at Rio Tinto in iron ore, energy, kaolin and aluminium; subsequently as managing director of Felix Resources in coal and with its predecessor, AuIron Energy, in coal, iron ore and direct iron smelting; and most recently, as managing director of Norton Gold Fields Ltd, acquiring, developing and operating gold mines. "This encompasses successful acquisitions, mergers, divestments and negotiation of joint ventures," it said.